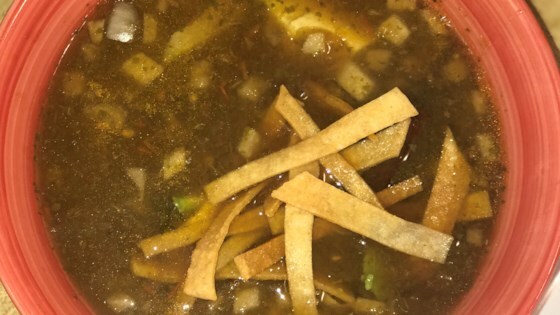 "This is a very popular Mexican soup. It can be served with any other Mexican dish. Just before serving, add tortilla strips and avocado cubes, so the tortillas stay crunchy." Heat oil in large skillet and carefully drop in half the tortilla strips. Fry in batches until golden brown and crunchy. Place fried tortilla strips on a paper towel-lined plate and pat dry. Sprinkle salt on tortillas, tossing to coat both sides. In a saucepan, heat chicken broth, chipotle chili, and pureed vegetables. Bring to a boil; remove from heat. Ladle soup into serving bowls. Prior to serving, add tortilla strips and avocado. Buen provecho! I am a Latina who loves Cilantro, but this soup had a little too much. Otherwise, it was great. I loved this soup. I do suggest that adding chopped raw onion and bit of lime juice does just the trick. The lime juice is essential when adding chicken. Thanks Andree! Absolutely great! I usually use water instead of chicken broth and I add lime juice. Wonderful result!